I was delighted to support the campaign against dog fighting and have the opportunity to learn more about the various campaigns carried out by League Against Cruel Sports Annual reception at the Houses of Parliament. The speeches reiterated the passionate support to address animal cruelty, and raise awareness on animal welfare issues. The current petition and commitment to end dog fighting was also shared to delegates. Barnardo’s marked its 150th anniversary in 2016 on Wednesday 13th July. 2016 at the House of Commons. Thomas Barnardo’s vision was for no child to be turned away from the help they need. I wanted to pledge my support on the dedicated work the charity does to help transform lives of young people. During its 150 year history the charity has helped transform the lives of millions of disadvantaged children in the UK, and continues to help families to build a better future. The anniversary is a moment to remember the many thousands who lost their lives, and to remember their families and the missing. It was also an opportunity to reaffirm our determination to act to prevent genocide in the future. We must never, ever forget what happened at Srebrenica, in Europe, five decades after the end of World War II. Did the world failed Bosnia in its hour of need? Those who were brutally murdered in the genocide of Srebrenica in 1995. Those who were left behind to grieve their loss, and who rebuilt their lives with courage and dignity. The women and girls who were brutally raped as a weapon of ethnic cleansing. The pink army gathered for the Race for Life 5k Charity run, in aid of Cancer Research UK. Local community women gathered in mass, to march for the frontline. The group of females were supported by many veteran runners. On route, I managed to see young and old, pink sparkle with props and dedicated passionate messages of what it meant to participants. Conservative women in Solihull and Birmingham, part of the West Midlands combined authority enjoyed taking part in the charity event either by running, walking and jogging. The race aims to help Cancer research fund its life saving work on prevention and treatment. 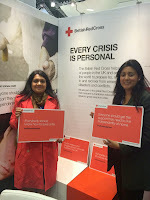 The British Red Cross Staff at the Conservative Party Conference explained the varied roles the British Red Cross plays to support humanitarian responses addressing conflict, and refusing to ignore personal crisis. 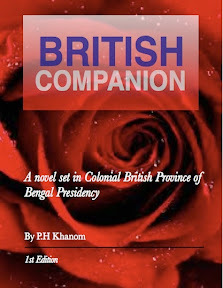 Their disciplines range from volunteering in the UK and deeper international projects. It was interesting to hear how they were specifically working on: the Ebola Crisis, stakeholder partners and progressive developments, raising awareness campaigns, conflict resolution training and assisting those in greater need. 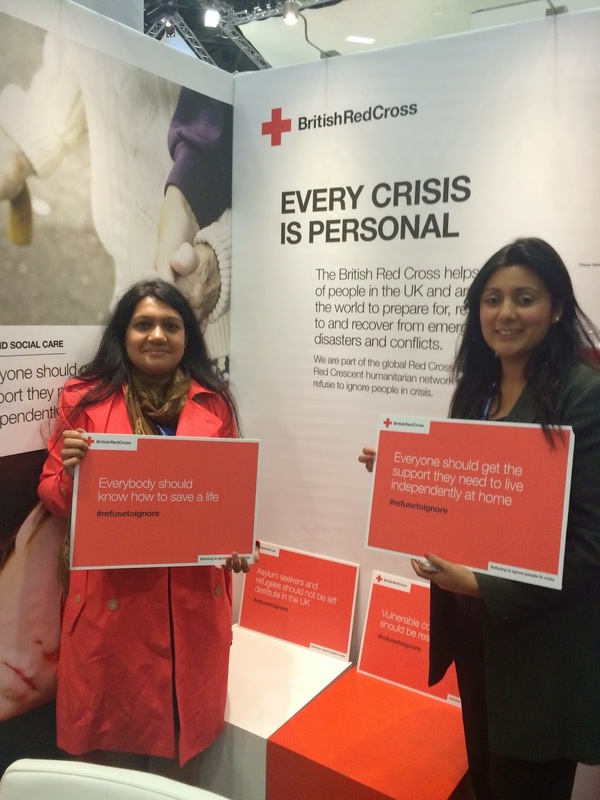 The British Red Cross, in the UK chairs a forum to improve and strengthen communications between non-governmental aid organisations (NGOs) and the British Armed Forces and Government Departments. This particular forum meets to discuss policy and operational matters and relationship engagement in humanitarian responses. Members and a number of representatives from: the International Red Cross and Red Crescent Movement, NGOs, the British Armed Forces, Ministry of Defence (MOD), Department for International Development (DFID), Foreign and Commonwealth Office (FCO), and independent specialists discuss these crucial matters. The visitors gained a great insight of the work and volunteers. Conservative Women's Organisation, Birmingham Heartlands Area Chairman Parveen Hassan has shown her support for our soldiers in Afghanistan by taking part in a Social Action project, packing Christmas boxes during Conservative Party Conference 2012. The project was run by ‘Support our Soldiers’ which seeks to encourage and provide support for members of the British Armed Forces on overseas operations and their families at home. The parcels will be sent to soldiers serving overseas during the Christmas period and contain items such as Christmas cake, snacks, hygiene products and books. Parveen joined other MPs: Grant Shapps, Conservative Party Chairman and volunteers helping to pack the Christmas boxes for soldiers in Afghanistan. Many CWO members and the national executive were doing what they could at the social action stand. Proudly in Birmingham many parcels were packed. I wanted the opportunity to help support and show my appreciation to members of our Armed Forces. They will not be with their families this Christmas. They are doing a tremendous job and we should all take time and remember the sacrifices they endure to keep global countries involved in conflict safe including our nation. Wear it Pink is back and stronger, charity campaigners, volunteers and our Conservative female politicians are setting the standard once again by supporting the annual campaign. Raising awareness for Breast Cancer research continues to ensure women affected have the appropriate support. The education programmes and funding activities is needed, as many volunteers give their time to raise funds through innovation and simple gestures. 1 in 8 women in the UK will get breast cancer at some point in their lifetime. Every 45 minutes, another woman dies. 50,000 women are still diagnosed with breast cancer each year. Take the step, support, and action now, more details can be found on the website breastcancernow.org to sign up and wear it pink on the 23rd October 2015. I pledged my support to the fight against heart disease for World Heart Day (29 September). 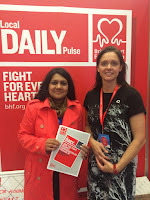 I made a series of visits to the British Heart Foundation stand at the Conservative Party Conference in Birmingham to raise my personal awareness of Cardio Vascular Disease (CVD). I was intrigued to learn CVD is responsible for around one in four deaths and takes the lives of more than 100 people under the age of 75 in the UK every day. 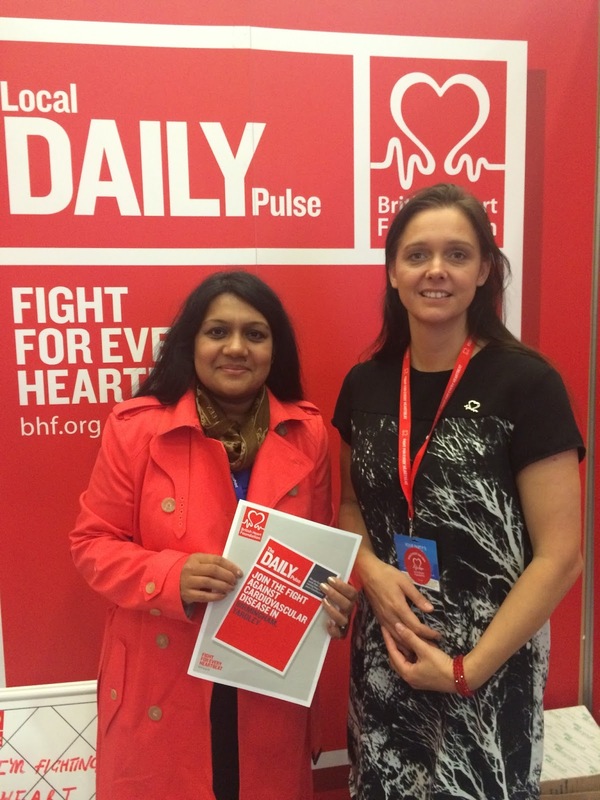 The specialists at the stand gave an insight on the work done by the British Heart Foundation. 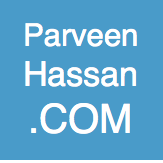 Excellent and informative, they even provided data on my constituency in Birmingham Yardley. I was deighted to speak at the West Midlands CWO event hosted by Action Aid UK, West Midlands on Tuesday 6th December. Action Aid UK, and CWO collectively wanted to champion #16days as part of the Fearless Campaign. I had the opportunity to share the role of CWO and political activism as action change makers. 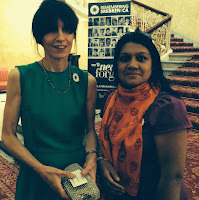 Action Aid UK, provided information on their global campaigns to support and transform lives of women and girls. These international dedicated women’s organisations fighting to address women’s rights and those most marginalised women and girls in the developing countries. I was joined with Kenyan women’s rights activist Jess Njui- who spoke about international grassroots activism improving the lives of women. One of the biggest challenges facing our society is how we combat loneliness among elderly people, and I was pleased to have backed Age Cymru's campaign to raise awareness of the issues of isolation and loneliness. Age Cymru helps people enjoy a better later life by providing life-enhancing services and vital support, practical services to assist people remain independent at home and continue activities they love doing. It was interested to learn more about the work in Wales at the Conservative Spring Forum and how Age Cymru campaigns alongside older people for changes in legislation, policy and practice that will bring a better later life. The network of shops also acts as point of contact for local communities, providing valuable information advice and services. 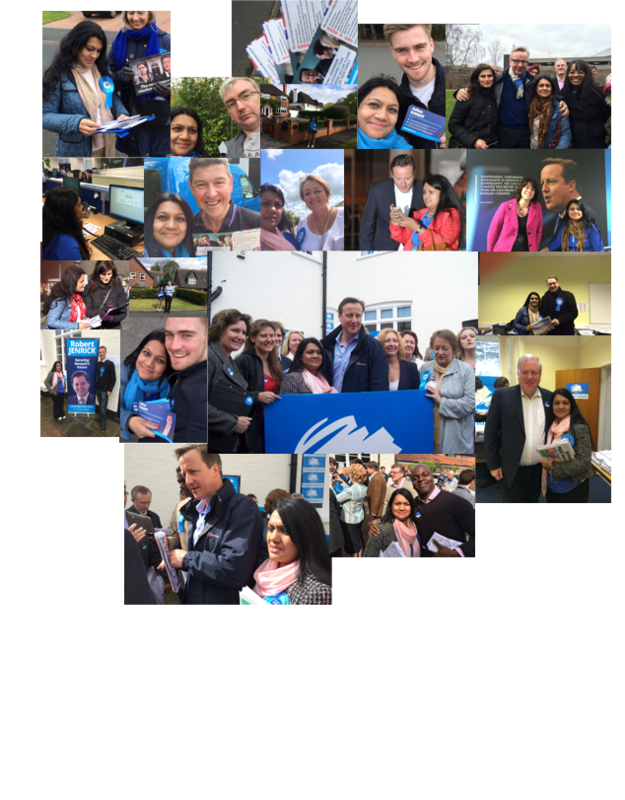 I experienced the Conservative Party election campaigning through the voluntary party network. I had the opportunity to engage with different communities, and assist veteran campaigners during the election campaign trail. Activities included: fund raising, GOTV, engaging voter intentions, surveys, leafleting, fund raising, tele-canvassing, dawn raids on the crucial day for the 40:40 seats in the locality.